diffidence about her which may not be evident to the outside world. She may appear proud and confident, but the shape of her Jupiter finger (on her right hand) shows elements of self-doubt. She is right-handed and it is the right hand which shows her current state of mind. You can check out her hand photo here. 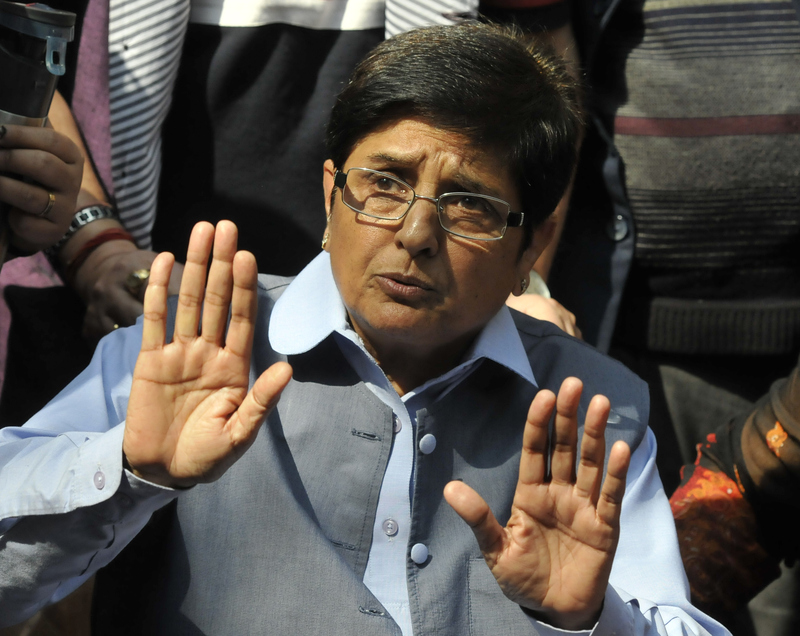 Kiran Bedi has long fingers with long first and second phalanges, and a very strong Apollo (ring) finger. The finger of Jupiter (index finger) is weaker but the thumb is long and well-shaped, and the finger of Mercury (little finger) is exceptionally long. Her hand is flexible, but her palm is not broad, although it is not too narrow. However, the headline is not a well-etched line. On her left, passive hand, she has a simian line (head and heart lines as one). The Jupiter finger on her left hand (which shows inherited qualities) is better, and this means that she was not born with the insecurities that she has tucked away deep in her heart. One can assume that her inner confidence could have been shaken due to disturbances in her childhood. As her left hand reveals that she had inherited strong-headedness, this could possibly have caused conflict within the family. Often one inherits a major personality feature from a parent, and it is likely that one of her parents shared this same trait. This would increase family conflict. To her credit, Kiran Bedi gradually changed, due to her own efforts. Her personality has been on an even keel for many years now, probably ever since she was in her mid-twenties and achieved what she wanted to. However, her struggles in her early years with self-esteem could have left a permanent mark on her persona. Also, as her headline on her right active hand is not as strong as the heartline, it means she could make mistakes in judgement. There is a lack of objectivity. Even today Bedi has a tendency to do exactly what she wants, regardless of what others think, but her hand shows flexibility as well. She has an ability to adapt. She is a very smart and shrewd woman who can back off when cornered even if she believes that she is right. Self-interest and survival is foremost on her mind. She is willing to see reality and make compromises. Her thumb shows extraordinary executive and administrative ability. From whatever little is visible of her headline, it confirms her organizational abilities and pragmatism. Additionally, the phalanges of her fingers show that she has a strong quest for excellence and perfection. Actually, people such as her don’t see their jobs as just work, they like to take their jobs to a higher level. They want to do things in a way that no one has done before. Kiran Bedi is very good at understanding people and possesses a shrewdness which enhances her leadership ability. This is a remarkable ability of hers, her ability to manage and control people. She can control and manipulate others with ease. Her thumb shows that she can be blunt, but the truth is that this woman can be diplomatic when she wants to be. She knows how to use words, but likes to stick to practical common sense ideas. She does not like esoteric or vague ideas or solutions. She is driven by a need for recognition (Apollo finger). This desire for renown increased as she grew older. She enjoys power, and this strong desire of hers for fame and attention has probably got her into trouble in her life. She is the kind who will take risks if the stakes are high, and she is likely to go by her feelings. She could go too far at times and can become boastful and overestimate herself. Kiran Bedi's hands show that she may not be an easy person to live with. She may expect more from others than they are able to give and can be fairly critical and demanding. She also has a temper, although she is not overtly aggressive. If one has to summarise her personality one can say is that she is not what she appears to be. She is eminently capable, yes, but she has vulnerabilities that she hides very well. Or read the hand analysis of Politicians from India and abroad. Isn't over coming our inner weakness the most important thing? Especially when people are creative/intelligent- your mind is the only one that can hold you back..
Vishesh, yeah I agree. She is a tough lady. However I think that creative and intelligent people find it easier than dense ones. Its only when you have an imagination that you can even imagine that you can change! hey NIta., do u believe or read astological profiles of people. according to kiran bedi's birth chart she has a scorpion moon sign which suggest that the native will be full of will power and a never ending fighting spirit. also kiran bedi is born on 9th which neumeroligically makes her a natural fighter. Mr. Curious you seem to know a lot about these other fields. But I do not. I am an expert only in Palmistry. What I like about Palmistry is that it is accurate a hundred percent of the time if one follows the principles. I do not know enough about the other fields, but to my knowledge they do not have principles that work a hundred percent of the time on everyone. However as I do not know enough about these fields I cannot really tell. Thanks to the links to Lalu's hand. You reminded me that I need to read his hands! Will surely do so, as pics of his hands are available. My next reading is that of an international personality and after that I will read this guy's hand. 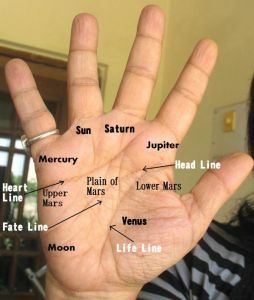 @ nita i agree with u, palmistry is very accurate. every person on this earth has his own strengths and weaknesses. its not that bcoz kiran is great she doesn't have any weaknesses right. i mean to say dat if v want to follow her v need to follow her positive traits not the negative ones. Thank you for your comment. Yes, everyone has his/her positive side and a negative side and all we can do is try and control the negative side and develop the positive side. Now that Mrs.Bedi has joined BJP for contesting Delhi elections, What does her palm tell us about her capabilities as a politician to counter Arvind Kejriwal? It is well known that she is a very capable administrator and there is nothing on her hand to show otherwise. Such people can do well anywhere, they just need to want to. And it looks like she does want to. Flexibility is present with her. If you read the analysis again you will notice that I have said she is a very shrewd lady. She will survive anywhere.